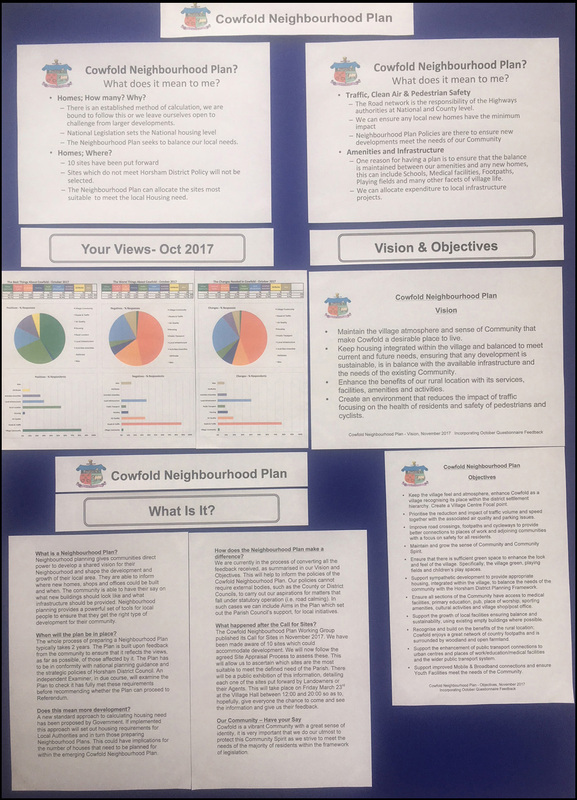 The Cowfold Neighbourhood Plan Working Group published its Call for Sites in November 2017. We have been made aware of 10 sites that the proposers believe are suitable for development. We will now follow the agreed Site Appraisal Process to assess these. This will allow us to ascertain which sites are most suitable to meet the defined need of the Parish. 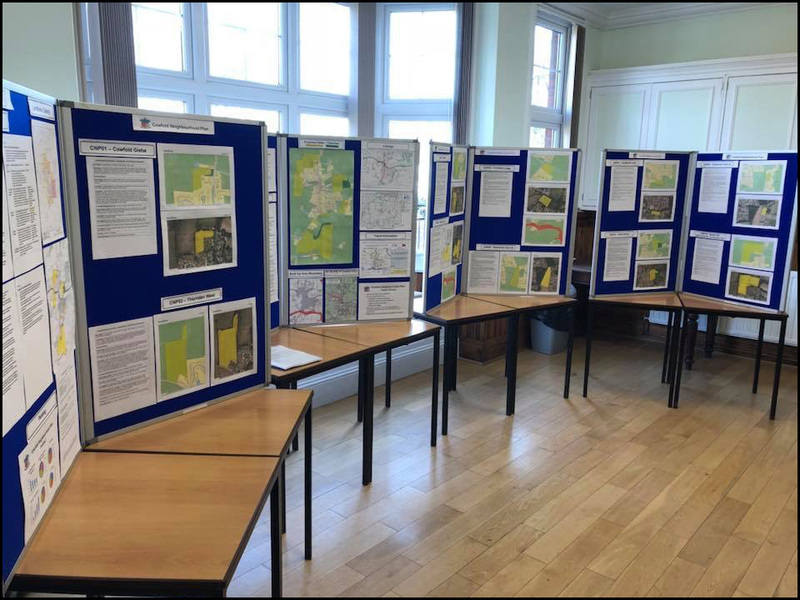 As a first step, a public exhibition was held in the Reading Room of the Village Hall on Friday 23 March 2018 from 12:00 to 20:00. This detailed each one of the sites put forward by Landowners or their Agents. 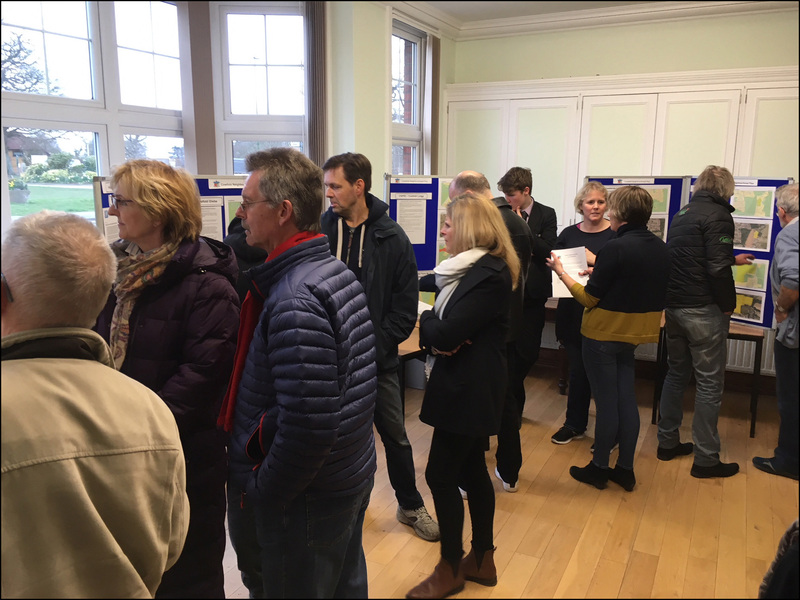 The exhibition was very well attended with over 200 visitors able to ask questions and air any concerns that they may have about the proposed sites and the overall Neighbourhood Plan process. 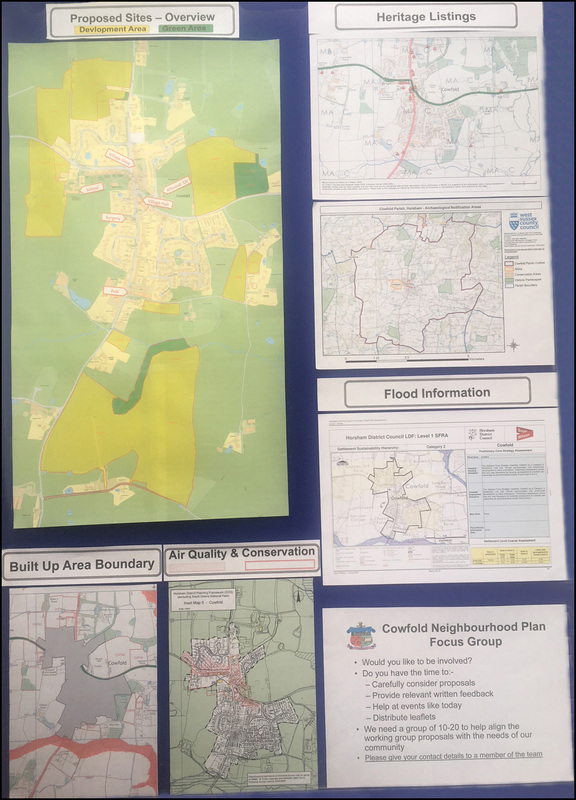 We are extremely keen also to get feedback from residents who were unable to come along on the day and images of the display panels are presented below. PLEASE REMEMBER THAT THE SITES DETAILED BELOW HAVE BEEN PUT FORWARD BY PROPOSERS FOR CONSIDERATION BY THE NEIGHBOURHOOD PLAN WORKING GROUP AND MAY NOT BE SELECTED AS BEING SUITABLE TO MEET THE NEEDS OF THE PARISH. THE FINAL AREA SELECTED WILL BE PROPORTIONATE TO THE NUMBER OF HOUSE REQUIRED. ANY DEVELOPMENT PROPOSALS WILL NEED TO BE APPROVED BY THE HDC PLANNING PROCESS AND COMPLY WITH THE RELEVANT HDPF POLICIES. 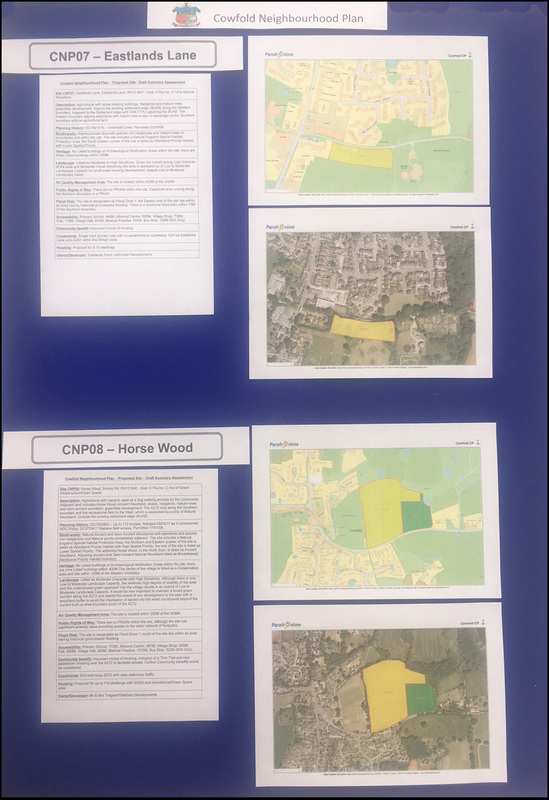 The following three panels include an overview of the proposed sites and additional information related to the Neighbourhood Plan process. Why so many sites and why are some are so big? 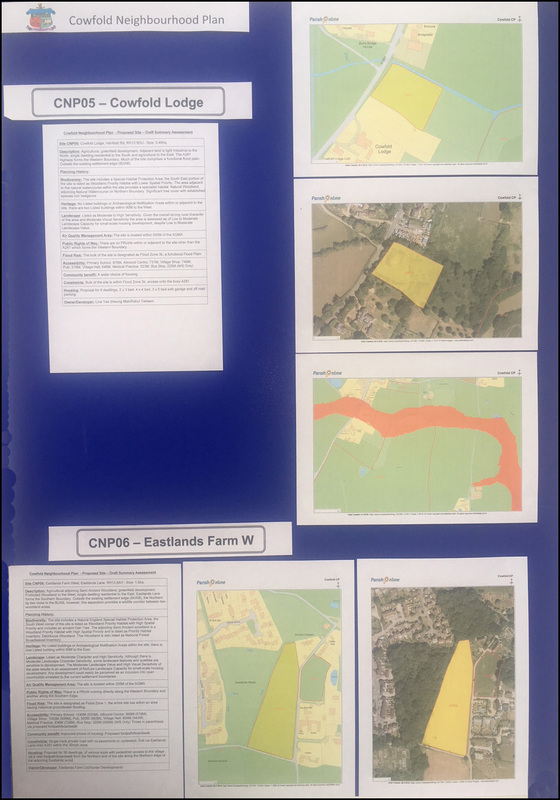 The sites shown are those proposed by Developers/Landowners or their Agents. Our job is to appraise them and identify which are suitable and to balance the area required to the number of houses in the plan. 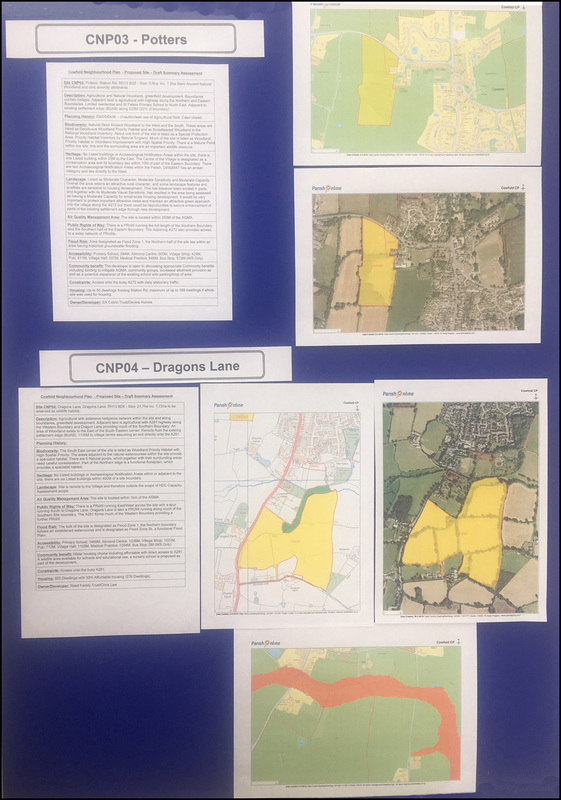 How many houses will be proposed and why? The number of houses will be a balance between local need, infrastructure capability and national plans. 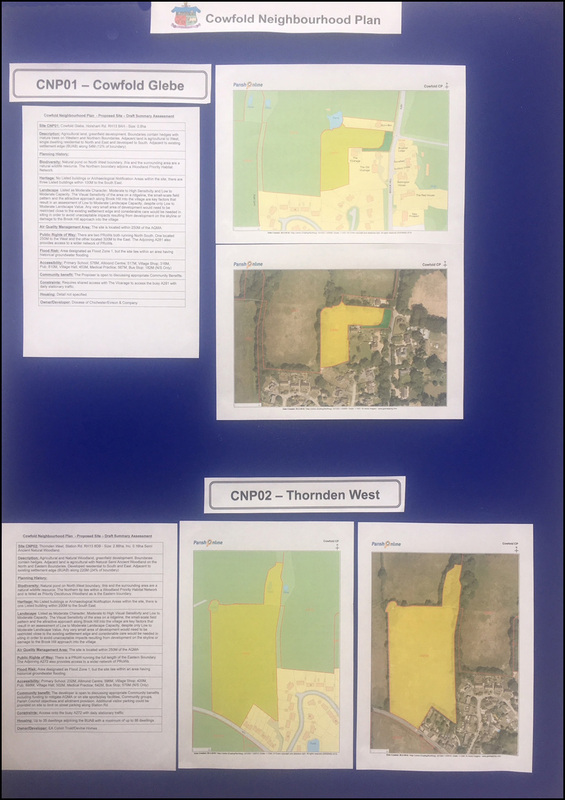 The Neighbourhood Plan will include a Housing Number calculated using a combination of agreed methods. All we know at this time is that HDC anticipates 1,500 houses spread between 22 Neighbourhood Plans. What are the timescales for the development of the Plan and its implementation? 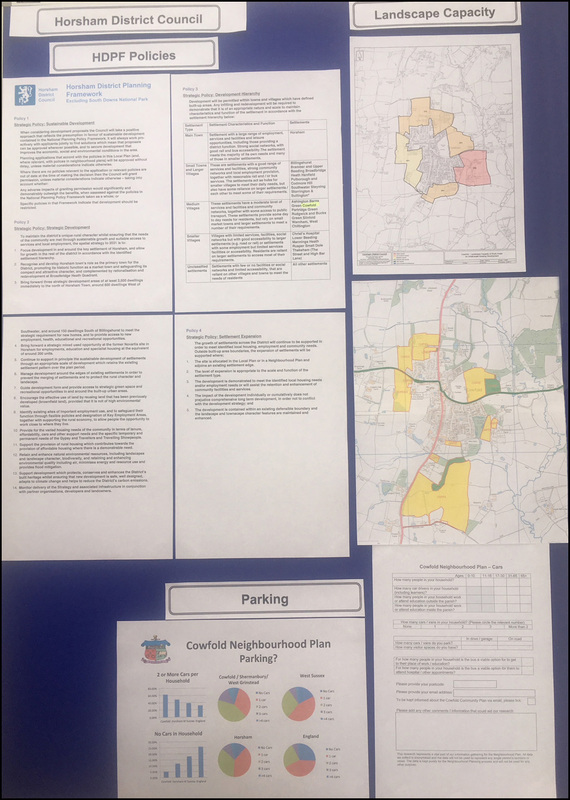 This is a long process that a group of volunteers is trying to ensure will best meet the needs of the community within the requirements of National and District legislation. Typically, it takes 2-3 years to complete a Neighbourhood Plan. 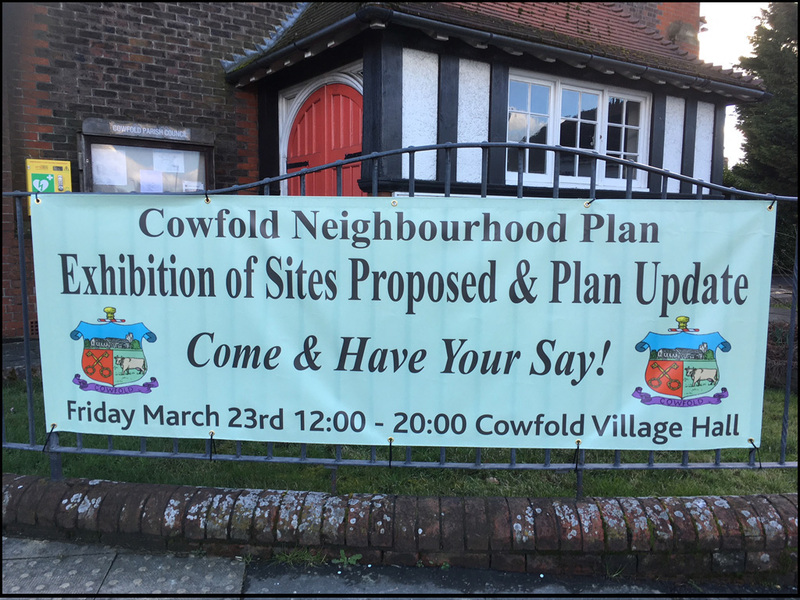 The final stages include approval by HDC and a referendum for Cowfold Parish residents. Without agreement from both HDC and the Community the plan has no legal standing. Anyone with specific questions can address these to jerry.hooper@gmail.com who will do his best to answer them.